No horse is perfect, right? 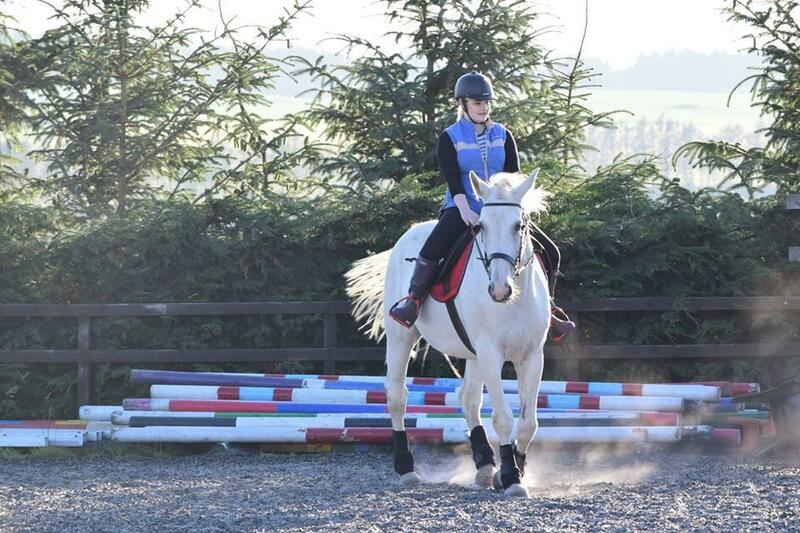 Well, I was starting to think that Zoe, my Irish sports horse was the furthest from perfect! I've always had a hot horse who bucks, takes off and starts sweating just at the thought of going on a hack but when we bought Zoe things changed. I now have two ridden horses (Shandy and Zoe) and they couldn't be more different. Shandy is the hot type horse that I mentioned above and because I have ridden him for 10 years I got pretty used to it! We then decided to buy Zoe who was not only much taller and longer, she is lazy AND spooky. When being ridden she needs a lot of leg and encouragement BUT she uses herself pretty well. The real problems came when she crushed me against the stable door (the second day we owned her) because she didn't have Shandy nearby. We then realised she had separation anxiety and when alone she turned spooky and unpredictable. I honestly think this was due to her having the same home for 13 years (where she was bred) before we bought her. See How Tense She Was? I started with groundwork. She needed to trust me enough to be taken away from Shandy without having a full panic attack. I did this by first walking around the school, letting her see that nothing was scary and that it was a safe place. I then did lots of in hand work. I wanted to make sure her focus was on me so I would walk with her and suddenly stop then back up before going forward again. 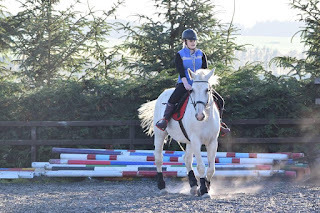 The key is to keep the horse's attention on you, walk over poles, around cones and constant gait changes. You are looking for your horse to focus on you and drop her head down low. Once she started to relax in-hand I started with lunging. Any change with Zoe would send her back to her spooky ways so I knew this would take some time. First I lunged in walk only, in a small circle and encouraged (not Forced) bending and a slight yield of the back legs which should result in the inside hind hoof landing in between the two front hooves. This should cause a natural drop in the horse's head and encourages relaxation. I highly recommend reading more about this technic on the no back pain website. Once she is working relaxed in the walk I start with trot doing the same thing. Then I start cantering and working on making the transitions more relaxed and natural. Now on to the hard part! It is only hard because a slight change in your body position can cause your horse to become tense again. So, I started riding Zoe in the walk for a week straight, no trotting! It took me this time to get her where I wanted her. So, I rode her on the buckle (basically drop the reins!) and made sure my position was as good as I could get it. Now the important part is keeping a rhythm, in horse training rhythm = relaxation. I did this all with my seat and legs. You want to really focus on moving with your horse to start with, I find closing my eyes helps a lot although this can be dodgy on a spooky horse! Once you have the movement you start slowing it down or speeding it up and your horse should follow you by slowing down or speeding up. This seems simple but you will feel really out of sync, this is good, it means your moving slower or faster than your horse. Once I mastered the seat aids I moved on to using leg aids. I used only light touches to avoid Zoe getting tense and only used my legs if I really needed too. You basically want to use your legs to encourage your horse to follow your seat aids. Once Zoe was doing great at the walk, I moved onto trot and then canter using the same technics. Should You Be Separating Equine Herds By Gender?